Creative talent exists in every individual. Everyone is well placed to suggest improvements in the way his job is done. Every individual takes an interest and pride in his work and is keen to make continuous improvements to his organization. His job becomes more meaningful and interesting when he is given an opportunity to make continuous improvements in his work. A suggestion scheme is a methodical tool of the management of an organization for improvement. It is also called employee suggestion scheme (ESS). By implementing suggestion schemes, organizations improve their profits, reduce costs, enhance employee’s morale, improve retention of employees, facilitate innovation and improve responsiveness to the public by improvements in service. ESS are mutually beneficial to both employers and employees. In an organization, many of the processes are driven by set procedures and instructions. Sometimes a necessity arises to modify procedures and instructions either because of a need arisen due to change in the external environment or because of some mistakes in the procedure or instructions. Suggestion schemes help in the process of initiating such modifications. Employees find their job more meaningful and interesting when they participate in the decision making process. Also they identify with the organization and pledge their commitment to improvement in productivity, improved service and management practice. Therefore suggestion scheme can benefit an organization significantly, if it is implemented with a correct approach. A suggestion scheme can be defined as a management tool, which encourages employees to contribute ideas for improvement and innovation in the organization. It is based on rationale that creative talent exists in each individual and he has the ability and is well placed to make suggestions to improve the way his job is being done. A suggestion scheme can also be defined as a formal channel which encourages every employee to suggest ideas which may be helpful in solving or avoiding problems or improving work process or the work environment. Through the suggestion scheme, an employee can participate directly in the improvement of productivity in his organization. An employee will find his job more meaningful and interesting when he participates in the decision making process involving his work. The primary objective of a suggestion scheme is to inculcate a value and culture of looking for continuous improvement and to contribute towards such improvements. Therefore, any idea initiated by an individual towards making continuous improvements to work procedures and processes, whether directly relating to the individual’s work or not needs encouragement. The first recorded implementation of a suggestion scheme was in 1770 when the British navy has asked its soldiers by this scheme to express their ideas without fear of punishment. In 1880, William Denny & Brothers shipyard in Scotland introduced the first physical box to collect ideas of employees. NCR became the first American company in 1892 to implement a companywide suggestion scheme. The concept was the ‘hundred-headed brain’, developed by CEO John Patterson. Suggestion boxes in the manufacturing sector became popular in World War 2 and in the post war period. Soon suggestion schemes became part of the Total Quality movement and an integral part of cost, safety and quality improvement initiatives in an organization. The suggestion scheme process involves writing of suggestions on a predefined format by the employees of the organization and dropping the same in a suggestion box which is easily accessible. A designated employee empties the suggestion box/boxes regularly at a predefined interval. He lists all the received suggestions for their further processing. A designated committee of the employees meets and goes through all the received suggestions and decides which suggestions are to be implemented. The accepted suggestions are then acknowledged to the suggestor. Due recognitions and rewards are given to the suggestors of the accepted suggestions. 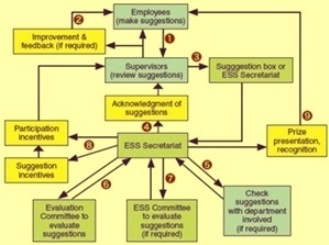 A typical process flow of an employee suggestion scheme (ESS) is given in Fig 1. An idea is a suggestion only when it is beneficial to the organization and fulfills one or more of the following criteria. The idea does not violate the vision, mission and objectives of the organization. Improves usages of resources, materials and space etc. Successful implementation of a suggestion scheme does not depend on whether it is a complex scheme or a simple scheme but how the organization actually motivates its employees to participate actively in the scheme. The following factors are for getting success in the implementation of a suggestion scheme. There is a well developed administrative system to facilitate the processing, evaluation, monitoring and rewarding of the employees. There should be a clear criterion for steering the suggestion scheme towards achieving the targets. There is a detailed and consistent evaluation criterion. The scope of the suggestion should be clearly defined. There should be a good combination of tangible and intangible awards which should be organized to motivate the employees to participate. Further there are to be promotional awards such as ‘Best suggestion of the year’ and ‘Highest numbers of suggestion awards can be given.